For U.S. readers, the title of this post may not seem quite right. You’ve heard of stops, based on either reasonable suspicion or probable cause, and frisks for weapons following a stop. You know about racial disparities in criminal justice data. But, what’s stop and account? Stop and search? And, how do they differ from stops and frisks? As I’m in London for the fall, the answer is pretty obvious that these terms refer to police authority in the UK. What may be less obvious is how this authority resembles the stopping powers of law enforcement officers in the US. Stop and account. In the UK (except in Scotland), police have the authority to stop you without any grounds and ask you limited questions, such as your name, what you’re doing in the area, and where you’re going. This authority to stop and question is commonly referred to as stop and account. You do not have to answer an officer’s questions or even stop if the officer does not have reason to suspect you of criminal activity. The UK government’s official website helpfully describes these powers and your rights here. US criminal law does not give officers this authority. Under the Fourth Amendment of the US Constitution and comparable state constitutional provisions, officers ordinarily must have individualized suspicion, in the form of reasonable suspicion or probable cause, to stop a person even to ask for identification. I had no difficulty explaining to the students in my class the legal difference between the US and UK approach. I had more difficulty explaining the practical difference. In Terry v. Ohio, 392 U.S. 1 (1968), the US Supreme Court established a low bar for stops, allowing officers to stop a person based on reasonable suspicion, a Terry stop. Cases since then have relied on a seemingly amorphous and shifting set of factors to uphold stops. In Whren v. United States, 517 U.S. 806 (1996), the US Supreme Court lifted Fourth Amendment restrictions on stops of vehicles based on probable cause, effectively allowing “pretextual” stops. As long as officers observe some traffic violation—a common occurrence given that vehicle use is so heavily regulated—they may stop a vehicle even if their real reason for doing so is to investigate matters for which they do not have evidence. Stop and search. In the UK, police have the authority to stop and search you if they have reasonable grounds to suspect you’re carrying illegal drugs, a weapon, stolen property, or something that could be used to commit a crime—broader authority than US officers’ authority to frisk. Under Terry, officers may frisk only for weapons and may do so only if they have reasonable suspicion that the person is armed and dangerous. The practical difference may or may not be significant. US courts are deferential in allowing officers to frisk a suspect for weapons in the interest of officer safety. The US Supreme Court has recognized a “plain feel” doctrine, allowing officers to search and seize items other than weapons that they discover during a frisk for weapons. See Minnesota v. Dickerson, 508 U.S. 366 (1993). Officers may extend a stop to ask for consent to search as long as they can meet the standard of reasonable suspicion for continued investigation. Racial disparities. Data on stops in the UK show troubling racial disparities. Recent data show that people of color (Black, Asian, and Minority Ethnic, referred to by the acronym BAME in the UK) are four times more likely to be stopped. See Police powers and procedures, England and Wales, year ending 31 March 2017 at p. 7 (Home Office, 2017). In 2016/17, the stop rate for Black people spiked to eight times greater than for White people. See Statistics on Race and the Criminal Justice System 2016 at p. 27 (Ministry of Justice, 2017); Stop and search (Home Office, 2018). The numbers seem worse than in North Carolina, where data indicate that Black motorists are 1.5 to two times more likely to be stopped than White motorists, high but not as high as the UK numbers. See Baumgartner et al. at pp. 68–69; Alyson Grine & Emily Coward, Raising Issues of Race in North Carolina Criminal Cases at § 2.2 (2014). Other data shows progress in the UK. 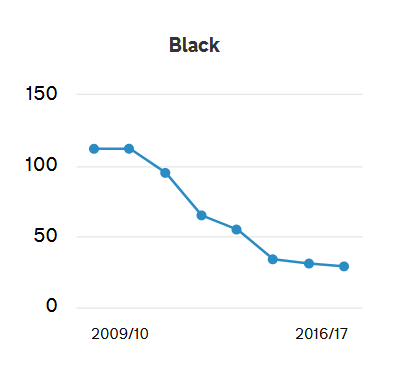 Although the stopping rate of people of color and Black people in particular is higher, the overall stopping rate has declined significantly, as shown in this figure from the UK government website (per 1000 people). Although I am suspicious of the suspicionless nature of “stop and account,” a benefit is transparency. 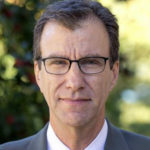 If racial disparities exist, authorities must go beyond claims of reasonable suspicion to stop or probable cause of a traffic violation to explain the disparities. As evident from the cited materials, UK agencies have devoted considerable energy to compiling and analyzing data on racial disparities in policing and other aspects of criminal justice. In 2016, the Prime Minister requested a study led by a member of Parliament, David Lammy, to investigate evidence of bias in the criminal justice system against Black defendants and other minorities. The resulting report, the Lammy Review, sparked a national dialogue among involved agencies and officials, including responses by the Ministry of Justice, Magistrates Association (who serve as judges in North Carolina’s equivalent of district court), and correctional officials, as well as advocacy groups and commentators. The report issues this challenge to the criminal justice system (CJS): “If CJS agencies cannot provide an evidence-based explanation for apparent disparities between ethnic groups then reforms should be introduced to address those disparities.” Lammy Review at p. 7. This principle of “explain or reform” puts the burden on criminal justice agencies to evaluate their policies and practices and address unjustified disparities. Just curious, if you can touch on it, if the concepts of “reasonable grounds” and “reasonable suspicion” between the UK and US align…are the elements fairly compatible or, for example, does the UK take a more stringent view on what facts support reasonable grounds?